You know what I hate? Anyone want to take a guess? Cabbage. Swiss Chard. Herbal Tea. Feeling thirsty. I also hate the phrase “Practice makes perfect.” If you know me at all, you know I’m a recovering perfectionist. It wasn’t until I had kids that I broke down and started letting God deal with my perfectionism (because I started to drive myself crazy trying to be perfect AND be a mother! Can those two things even go in a sentence together?). But back to that phrase. Can I explain why this is the perfectionist’s nightmare? It gives the illusion that perfection is attainable. While it is impossible for someone to actually be perfect, this saying, something that I said to myself over and over growing up and something that is often said to kids who are trying to learn a new skill, makes you think that someday you will arrive. If you just try hard enough, work long enough, strive enough, pressure yourself or others enough, have high enough standards, or give enough, you will be able to attain that perfection. The clincher is that no matter how much “enough” you get to, you will never actually arrive. You will never be perfect. Sometimes I see seeds of perfectionism growing in my kids. They’re holding themselves to some kind of standard that is unreasonable and can’t be reached. When this happens, it’s like I see myself in a miniature body, and it’s not the “Myself” I always wanted in my kids. One day we had a serious all-out meltdown because Micah couldn’t copy the drawing of a face exactly like the example. It literally ruined his day. You know what was wrong with it? The ears were lower than the original. See, one problem with perfectionism is that it completely halts any kind of growth. Instead of being able to see that this drawing was an opportunity to learn more about art, or that the ears being lower could even be a nice change to the picture, perfectionism pointed the failure finger and slammed the growth door in Micah’s face. When I allow perfectionism to actively participate in my life and into our home, we get hung up on what isn’t happening – the house isn’t getting clean enough, the kids aren’t reading enough, we aren’t getting outside enough, I’m not reading the Bible to them enough, we aren’t eating enough healthy food. They aren’t picking up toys often enough, they aren’t getting along enough, they aren’t responding to me nicely enough. Enough, enough, enough! Instead of getting hung up on what is good and right in our family, seeing hiccups and speed bumps and potholes as areas for tangible growth, we let the walls close in. We get tunnel vision and we begin to feel the pressure to meet some kind of standard that a normal, healthy, godly family is never called to reach. For example, I aim for willing obedience from my kids. My perfectionism aims for them never needing grace. I aim for consistency in patience and kindness toward my family. My perfectionism aims for never having days when my patience is tried or I don’t feel kindness. I aim for teaching my kids to take chances in learning and growing. 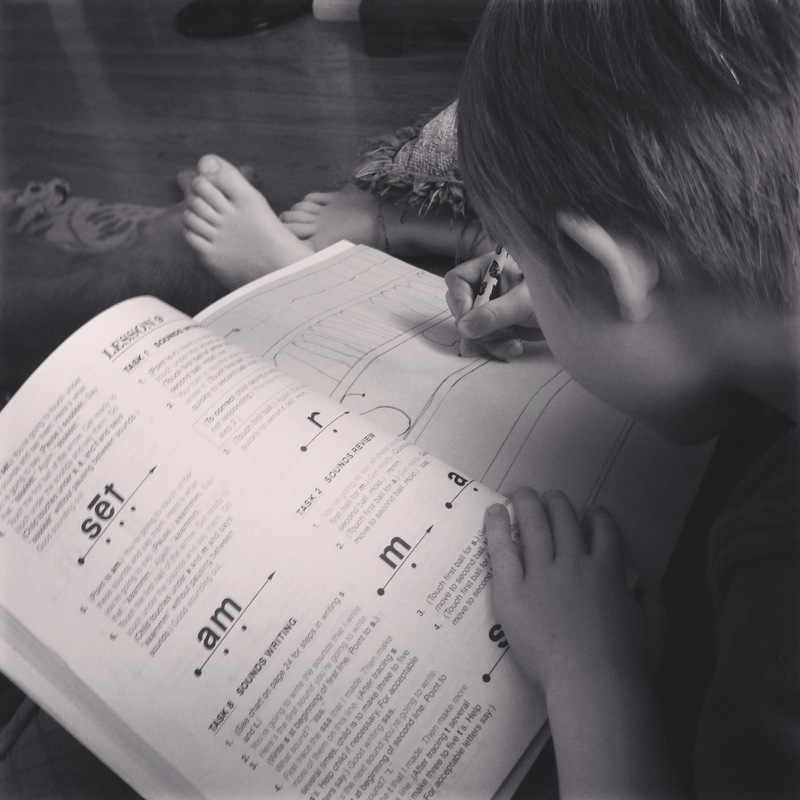 My perfectionism aims for my kids trying something once and doing it right thereafter. See the difference? Allowing perfectionism to seep into my kids’ lives from my own expectations creates stress, unneeded pressure, and all around misery. Because I don’t want this lifestyle, I’ve been trying to change. For example, for my own sanity, I’ve decidedly given up writing to-do lists. This might sound funny to you, but it feeds my perfectionistic pride to have a huge list of to-dos and to cross them off. Crossing them all off means I had a perfectly productive day. Leaving even one shows that I failed to accomplish. Sounds ridiculous, right? It is utterly ridiculous. Which is why I refuse to indulge it anymore. With my kids, I allow mess, like letting them cook with me and getting flour everywhere. And letting them paint or pour liquids or fold laundry in the way that they choose. Today Norah so willingly helped me fold a huge basket of laundry, and it took everything within me not to refold each piece she handed me. Instead of refolding them, I took the opportunity to teach her how to do it, and even though it wasn’t “right,” it was folded. Kind of. I also try not to compliment them by saying things like “That’s the best picture you’ve ever drawn!” or “That was the funniest joke I’ve ever heard!” Guess what? Those kinds of compliments imply that they’ve arrived. If that was the best picture ever, the pressure is too great to keep working at it to get better. How can they compete with the best picture ever? Or on the flip side, if they’ve already done the best, then why even work for it again? I know they don’t consciously think through compliments that deep, but I’m trying to feed their hearts and minds with a growth mentality, not a stagnant mentality. * If I say, “Wow! That is a really good picture!” I still fulfill the desire to be praised for a job well done, without giving them an unnecessary standard they have to meet or exceed next time. Investing in a growth mentality means that I feed their desire to keep going, keep learning, and keep taking the chances to succeed. They won’t be as afraid of failure because a less-than picture isn’t being measured against the already-perfect picture from before. Failure isn’t debilitating because their learning plane isn’t reaching for the highest heights, only to crash to the lowest lows when something isn’t just right. Yes, some perfectionism and fear of failure is part of personality. It is in me. But that doesn’t mean we have to be stuck in it. If anyone understands the struggle against perfectionism, I do, and I’m willing to do what it takes to help my kids not be paralyzed by its unreasonable standards. And the beautiful thing is, by them simply being around, they’re helping me learn the same thing. *This idea of growth vs. stagnant mentalities comes from the book Mindset by Carol Dweck. I haven’t read the whole thing yet, but what I have read has rocked my little perfectionistic mind. ← Discipline: Round 3000. FIGHT!